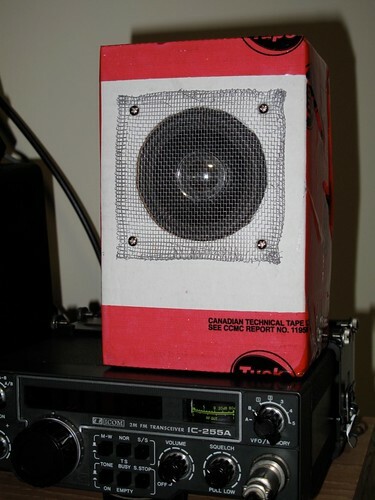 A few years I picked up a 3½” speaker (for around $5 if I recall correctly) while browsing in a local electronics and surplus store (which has since closed down). This 4 Ω speaker looked quite good and I suspected it would make a good communication speaker when placed in an appropriate enclosure. I had also considered adding a small onboard amplifier too, perhaps based on an LM380 or similar. Following a recent purchase of parts I had a rather sturdy cardboard box which had contained the parts for delivery. That box looked a suitable size for housing the speaker, so I decided to repurpose the box rather than put it in the recycling. 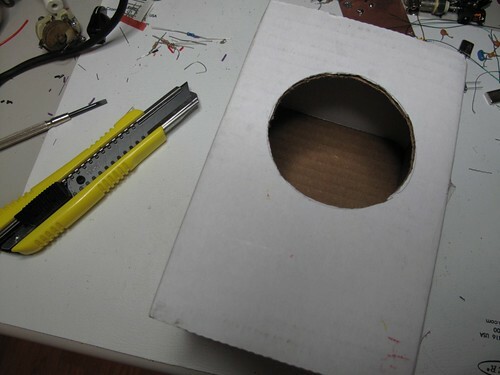 The great thing about cardboard is that it is very easy to work with. The set of photographs below show the building sequence, which was quick and completed in about an hour. The speaker cable was surplus hifi speaker wire. The box was sealed with tuck tape, which was left over from the basement refurbishment. 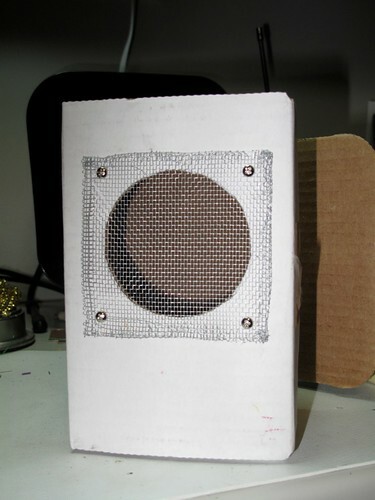 The speaker grill was some aluminium screen door mesh, again left over from another project. I did not bother with the on-board amplifier, which I had considered in the past. The sound quality, it is good. I have it connected to the Icom IC-2200H 2m FM/D-Star radio, which drives it easily without the need of extra amplification. It certainly sounds better than the existing external communication speaker I have been using. Which is a little smaller and in a plastic housing. 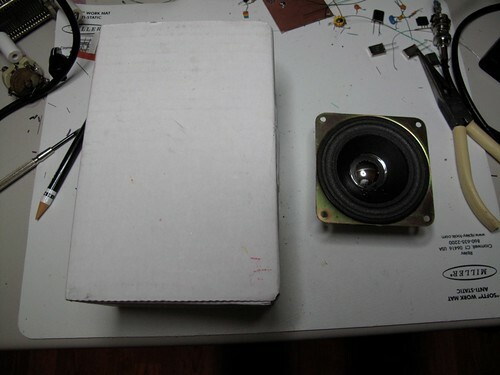 The cardboard box speaker seems to have a better frequency range, especially at the lower end , giving it a warmer tone. Voices sound clear and natural. In particular I find it works much better for D-Star, than the other speaker. It makes the digitized voice much more natural. I have been listening to it for a week now and it is staying connected to the IC-2200H. A quick, fun and very cheap project, with a unique appearance. Glad you like it. It was fun to build. My wife thinks it looks retro and my daughter said ‘Cool. Tuck tape!’.